The Custard TV: Why we're excited for the return of My Mad Fat Diary. Why we're excited for the return of My Mad Fat Diary. The first series of the E4 comedy-drama, My Mad Fat Diary was an unexpected pleasure. Anchored by a sledgehammer emotional performance from Sharon Rooney and with the delightful Claire Rushbrook and Ian Hart providing support, it was just a joy to watch. Painful, candid and unashamedly honest in its portrayal of adolescence, My Mad Fat Diary was one of my highlights of 2013. Going simply by this series two opener, I can predict a positive future for the wonderful show. Regrettably young teenage protagonist Rae is still as self-conscious as she was at the beginning of the last series. Rooney slips back into the role effortlessly and imbues Rae with that bellicosity that masks her low self-esteem and opinion of herself. She’s still keeping in touch with Dr. Kester Gill (Hart) and her friend, Tix from the hospital but they stick more to the sidelines. It’s Rae’s gang: Izzy, Chop, Chloe, Archie and Finn that take centre stage as Rae and Izzy plot to lose their virginity to the boys (bar closeted Archie, who has an embarrassing incident with a randy Chloe) in the countryside on a camping trip. Cue a trip to get some… equipment for the occasion (and no, no tents, Rae). Sharon Rooney and Nico Mirallegro, who plays Finn, make a convincing couple and there’s a certain scene that might excite those in the audience with a crush over Finn. 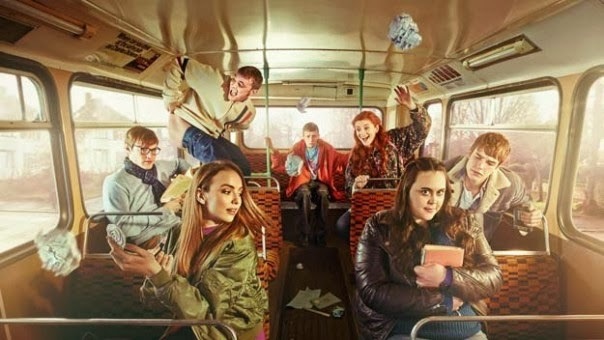 Meanwhile Ciara Baxendale, Jordan Murphy, Dan Cohen and even Jodie Comer are given little to do although they’re all reliable for some levity in My Mad Fat Diary’s more serious moments. Linda and Karim Bouchtat, Rae’s eccentric mum and virtually mute stepfather, are still as dotty as ever. Linda is a divine creation, weeping when she feels herself going through “changes” and quickly trying to disguise the fact she and her husband’s new bedroom-consigned TV (with built-in videotape player) is for watching pornographic films – although it makes for a very funny scene when Rae investigates. While Linda is amusing and still bickers with Rae, she hasn’t lost her caring touch, worrying after but not smothering her daughter. The second series of My Mad Fat Diary looks to be even more superlative than the first. Fast, witty and relevant (despite being set in the 90s), it’s one of my favourite comedies shown on E4 in a long time. Sharon Rooney’s beautiful rendition of Rae and Nico Mirallegro’s sensitive Finn remain the cornerstone of My Mad Fat Diary but with Rae enrolling in college, the picture looks to become broader.